According to the Telangana State Council of Higher Education (TSCHE), EAMCET date has been decided keeping in view other important exams in the country that are popular with Telugu students. Announcing the schedule of all the CETs in Jnaury, The convenors of all the CETs would be announced. So, as per the given Telangana State Council for Higher Education (TSCHE) schedule as foolows. These various Common Entrance Tests for the students of Telangana. Telangana Common Entrance Tests 2019 Dates Released. Schedule for TS CETs 2019 has been announced. 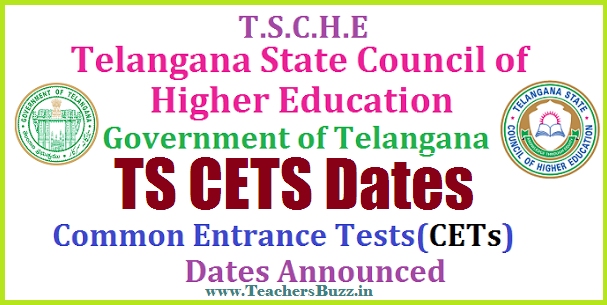 TS EAMCET 2019 Telangana LAWCET 2019 PECET TS ECET 2019 TS ICET Exam Dates Notification Telangana EDCET 2019 PG ECET 2019 Telangana State Council for Higher Education Released Schedule for Common Entrance Test for 2019 year. TSCHE has released the Entrance Exam Dates. Desirable candidates appear for these Common entrance Test suggested to check the Schedule for Telangana Common Entrance Tests 2019 for reference. Osmania University will conduct 4 CETs including LAWCET PG LAWCET on May 26 Post Graduate Engineering Common Entrance Test on May 27 to 29 and Education Common Entrance Test on May 30 and 31. The Chairman TSCHE Prof T Papi Reddy said that Except PECET all the CETs will be conducted through the Computer Based Test CBT Mode only. Tata Consultency Services will be utilized in conducting of the CBT Exam. The Council has Taken steps to complete the all cets in the month o f May only. TSCHE Confirmed that students from AP will have to write Telangana CETs to secure Admission in the State of Telangana. The Govt is Ready to help the Andhra Pradesh Govt in conducting the Examinations. CETs dates and Allotment of CETs to the Universities would be announced . TELANGANA STATE COUNCIL OF HIGHER EDUCATION MASAB TANK, HYD. Here we have provided official information of all Telangana CETs Dtaes. Stay tuned to our website for latest updates on education, upcoming recruitments, hall tickets etc. He also confirmed that students from Andhra Pradesh will have to write Telangana CETs to secure admission in the state. He added that the TS Government is ready to help the AP government in conducting the examinations. Earlier, in a meeting chaired by the Telangana Education Minister, CETs dates and allotment of CETs to the Universities was discussed. Now, the TS government announced the dates. So, this is good new for Students about these examination dates. The Telangana State Council of Higher Education (TSCHE) Chairman, T. Papi Reddy said EAMCET date has been decided keeping in view other important exams in the country that are popular with Telugu students. The AP students seeking to join institutions in Telangana need to appear for these tests.